Pictures and Final Details of Batman Arkham Asylum. I've been reading a lot of SpeedHunter's lately, also Kotaku has quickly become my favorite resource for gaming news. I really like the photo-blog style of Speed Hunters and the down to earth commentary on Kotaku. With that in mind I decided to add a little more flare here and there to the photos for this release and I've added a bit of personal commentary. I'd appreciate some feedback as to whether this is something you'd like to see more of in the future or if you'd prefer the more no-nonsense approach that I've taken in the past. Click the link below for more pictures and details. ... View this article on the HomePage. 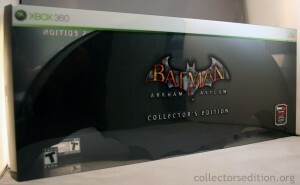 Re: Pictures and Final Details of Batman Arkham Asylum. It's great to have a little commentary with the pictures. Helps with deciding if the stuff is worth it or not. You should keep it up in my opinion. Yeah, what's with that? Take Assassin's Creed 2 for example. Master Assassin, White and Black Edition? It's kinda turning into discrimination between gamers. I think it's actually worse with Batman: Arkham Asylum. It's essentially the same Collector's Edition as in the US, but just a lot less work put into it.